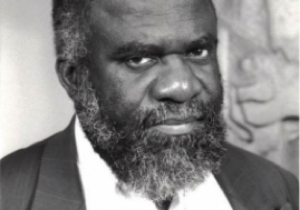 Using his concepts of ‘parallel lives’ and ‘intertwined belongings’ as a backdrop, Dr. Kwame Nimako will demonstrate in this lecture that the legacy of Atlantic slavery has given rise to five distinctively racialized movements on the subject of slavery. The five movements in question are remembrance and commemorations, reparations, anniversaries, museums, and the movement to combat so-called ‘modern’ slavery. At the forefront of the demands for remembrance/commemoration, anniversary and reparation are Black agency and activism; the museums and ‘modern’ slavery initiatives are predominantly white Euro-American. 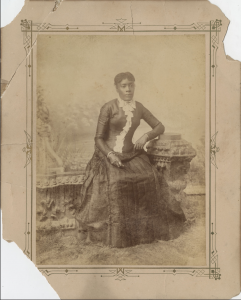 “Last Seen”: Finding Family after Slavery offers researchers a tool for telling family stories of separation and survival during slavery, emancipation, and the Civil War. It offers easy access to digitized “Information Wanted” advertisements placed in newspapers by former slaves and United States Colored Troops searching for family members lost by sale, flight, or enlistment. The ads mention family members, often by name, but also by physical description, circumstances of separation, last seen locations, and at times by the name of a former slave master. The earliest ads appeared in papers in 1863, and they continued for more than thirty years. “Last Seen”: Finding Family after Slavery allows users to search these ads by proper names, locations, circumstances of separation, military regiments, and events. Dr. Giesberg will demo and discuss the Last Seen project in a conversation moderated by Patricia Williams Lessane, Executive Director of the Avery Research Center for African American History and Culture. 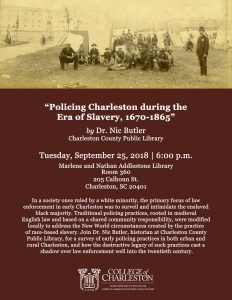 This discussion will provide the audience a historical outlook of the Lowcountry region and its relationship to as was well as denoting the challenges and solutions. 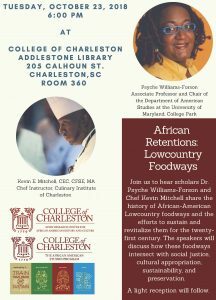 The speakers will be a representative of local farmers, scholars, and chefs, who will bring their perspectives on foodways, water, social justice, and sustainability.